we are all home from our wonderful voyages on Søren Larsen now. The 2 voyages, on which the Eye of the Wind Friends sailed, took us through the Islands of Vanuatu in the Pacific. We sailed through water which changed from deep saphire blue to olive green and on to beautiful turqoise. 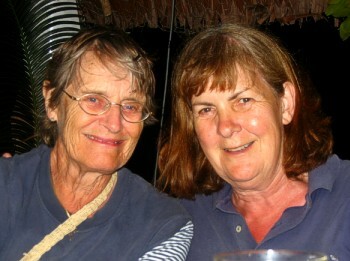 As we were only about 10 degrees south of the equator it was hot and sunny with only the occasional tropical shower. The islands look like everyone's image of palm fringed tropical paradises. Despite all the dire warnings of mosquitos and malaria, we all seemed to have escaped fairly unscathed. Our greater problem was cuts which festered in the tropical heat. However, being hardened world sailors, most of us managed to avoid getting into too much trouble. The Crew on Søren were wonderful. They were very professional, but also had great senses of humour and patience. Jim Cottier, our Captain, was known to me from Jubilee Sailing Trust days, when he had done a few relief voyages for Tony. He was also known to Tiger and those of us who had sailed on Eye on the second half of her Round the Horn voyage some 13 years ago. At that time he was Søren's Mate. 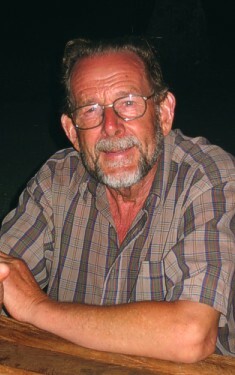 He has a wealth of sailing experience and his knowledge and enthusiasm was enjoyed by all. Added to all this was the fantastic food provided by the 2 tireless Cooks, Noreen (who some old Eye people will know) and Stacey. The islands of Vanuatu are small and sparsley populated. Most of the small villages are at the edge of the bush and more or less at the waters edge. The houses are mostly made of bamboo, with the odd island having started to construct houses of concrete blocks. As this is a cyclone area, the houses are often demolished in storms and have to be rebuilt. The islanders often lose everything they posess, which is usually extremely little, when they lose their homes. I think the memory most of us have come home with is that of the material poverty of most of the islanders. The gift of a second hand Tshirt or pencil, was gratefully received and you were made very aware of how privileged we all are and how much useless stuff we own. Having said that, you could almost envy the close community spirit and their ability to make the most of everything they have. These are not people to be pitied. Arriving on Søren Larsen meant an immediate welcome as Søren has always tried to provide what they can when they arrive. 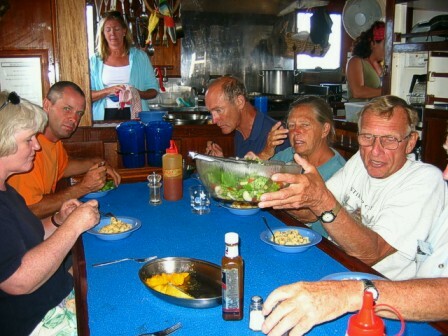 The Islanders always greeted us with offers of hospitality and we had several wonderful meals ashore, provided by the villagers. Often these meals were accompanied by Cava (a muddy liquid sqeezed from the Cava root), which is definately an acquired taste and to be approached with great caution. 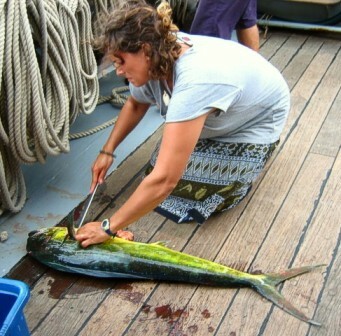 One or two of our voyagers did not listen to warnings and suffered the temporary anaesthetic results! It was also fun to see the the Chiefs greeting Tiger as a long lost friend, from his days when he visited on Eye and was as generous as we know he is. The islands are run by Chiefs and Captain Jim and Captain Tiger were always treated like visiting Chiefs. As most of the islands have no electricity they have little access to what is going on in the world. They consequently live in very traditional ways which have been going on for centuries. 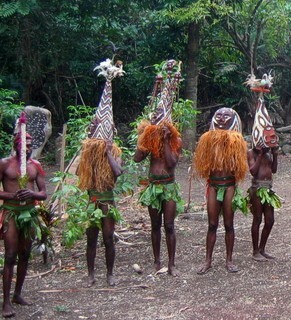 Each island has traditional dances and ceremonies and we were given several demonstrations. The highlight of many of our social events was the String Band music. As far as we could make out they seem to only have one or two tunes, but they have a great many songs. They also sing what they think are traditional English songs and there is something surreal about sitting on a tropical beach, in the dark, listening to a group of Islanders sing "Grand Old Duke (pronounced Duck) of York" and "Jingle Bells"! They also produce crafts including finely woven baskets, carvings and pottery pots. They are happy to accept money or to exchange their goods forclothes, food, pencils or other items which we had with us. Tiger was able to be a Voyage Crew member for the first time and able to chill out with the rest of us. I think he probably saw more of the islands than he ever did as Captain of Eye. He was able to jump in the boat and head for the shore the same as the rest of us, without any responsibilty for what was going on on board. He had plenty of time to sit and gossip too! However, his Eye roots are never far from him. When we arrived in Port Vila, on our last day, there was a huge super yacht anchored in the bay. We had only anchored ourselves for 5 minutes when a boat arrived from the yacht with one of Tiger's ex Crew, Axel, at the controls! All in all I think our Søren Reunion was a huge success. 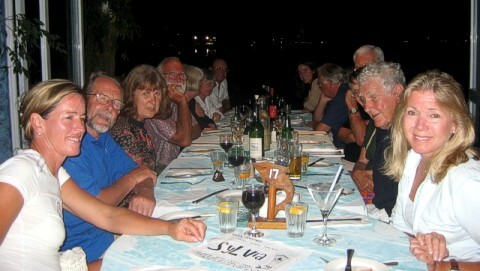 We also made new friends from the few non Eye people on board, who were great fun. Despite the Søren Crew's concern that we might divide into 2 camps, after a day you could not tell the difference between us. 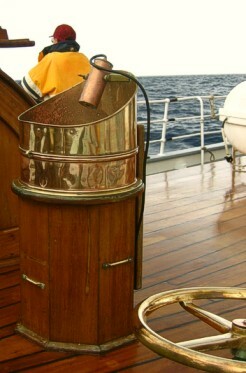 The Crew even conceded that having so many old sailing hands on board made their job much easier. If anyone is thinking of doing a voyage I think most of us would certainly encourage it. 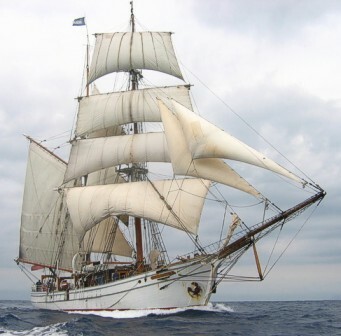 Søren has her major survey and refit in the New Year and will then begin her 2005 programme. One of the big voyages will be the passage from Auckland to Easter Island, which will give the sailors amongst you some great blue water time. In 2006 there is a good chance that Søren will return to the Atlantic and Europe for a year. During 2006 there will be the 50th Anniversary of the Tall Ships Race and I am sure there will be some wonderful sailing opportunities available. Tony and Fleur have promised to keep me fully informed and I will pass on any information as I have it. I think it would be great to have another couple of Eye Reunions and I am sure we can lure Tiger home for that. If you want to see some great photos from these voyages you will find them on the Søren website www.Sorenlarsen.co.nz (Ina's note: find Noreen's logs by clicking here for the first part and here for the second one!). I hope that some of the voyagers will also send images to Ina to put on this website eventually. If anyone is interested in what Søren is doing for the next 18 months you can find out on www.Sorenlarsen.co.nz. 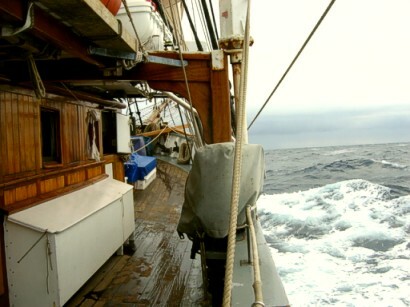 Anyone who has done a voyage on Eye or on Søren will be offered a 5% discount on all voyages. Let me know if I can provide you with more information. Ros Lewis, © pictures Trine Torgersen, click here for more of her pictures!